Here’s a really healthy breakfast idea that incorporates lots of healthy ingredients into something that we all love – pancakes! The big difference is – these pancakes are full of healthy fats and proteins, and they are completely gluten-free. Avocado is a filling food that will stop you from getting hungry on the Candida diet, while onions are on our list of antifungal foods. When you’re on a Candida diet and avoiding things like sugar and gluten, there are still ways to enjoy your favorite foods. All you need is a little creativity and some quality ingredients. It only takes a few minutes to cook these pancakes, and you probably have most of the ingredients in your cupboards or pantry already. Ingredients like coconut milk, avocado, and coconut flour are staples on the Candida diet and it makes sense to always have some handy. You can mix up the ingredients to take advantage of whatever fresh vegetables you have in your fridge. These pancakes are much, much healthier for you and your family than the regular pancakes that you might be making. With lots of healthy fats, protein and fiber, they will give you a long-lasting, sustained level of energy throughout the morning. A great way to start the day! In a small bowl, sift coconut flour, baking soda and salt, set aside. 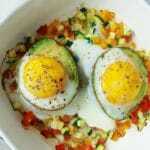 In a medium bowl, whisk the eggs, milk, sliced green onions and mashed avocado until thoroughly combined. Add dry ingredients and stir until combined. Heat a skillet over medium heat. Melt enough butter to coat the bottom of pan. For each pancake, spoon about ¼ cup batter into pan and cook until bubbles begin to appear on the top and bottom is golden brown, about 2 to 3 minutes. Flip pancake and cook until second side is golden brown, about 2 to 3 minutes. Continue with remaining batter, adding more butter to skillet as needed. Now prepare the Lemon Parsley Butter. Melt the butter and stir in lemon juice and parsley. Keep warm until ready to serve. 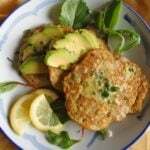 Serve pancakes with sliced avocado, spring greens, lemon slices and a drizzle of Lemon Parsley Butter. Garnish with thinly sliced green onions and minced parsley. Looking for more gluten-free, sugar-free recipes? My Ultimate Candida Diet program contains more than 100 delicious recipes, plus lots of valuable advice on which foods to eat and avoid. Find out more here. Do you know the # of calories in each pancake? Caloric count is not something I usually care about, however, now that I’m over 60 it seems to be harder to stay fit and even though food is healthier for me the # of calories I eat in a day does make a big difference. Thank you! Hi Gayle! I don’t have a calorie count for this recipe. 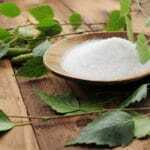 However, it contains no refined carbohydrates and lots of healthy fiber, fats and protein. All of these will help to fill you up throughout the morning and prevent the blood sugar spikes that can lead to weight gain. Hello. I see that you’ve come up with the calorie count for this recipe. For this and all other recipes, is the calorie count for the whole thing or per serving? Thank you so much! Can the coconut ingredients be substituted with almond ingredients? Yes they can, although almond milk might be a little thin compared to the coconut milk. The batter seemed a bit thick? I added some more coconut milk but the pancakes didn’t seem to hold together very well. The batter consistency was like very soft mashed potato. Any ideas? It can depend on the brand of coconut flour, and also how ripe the avocado is. You can adjust the recipe as you see fit by adding more coconut milk! These are so amazing. I have made them twice now, and I can’t get over how good they are! I didn’t make the butter the first time, which was a mistake, as it brought all of the flavors together when I made it this morning! Thank you so much for your delicious recipes! I also can not have dairy. What could I substitute for the butter? Could you try coconut oil instead of butter? Wow these were great! We used coconut oil in place of butter…next time I’ll try red palm oil. We made a nut ‘milk’ to replace the coconut milk (ground walnuts, sunflower seeds and almonds). Also added a little turmeric, garlic powder and flax meal. Excellent recipe! Thanks! We can eat butter on this diet? is this coconut milk from a can for baking purposes or the refrigerated kind? Just made this today for lunch and even tho I used lite coconut milk and my avocado was not ripe enough, the pancake itself was SO delicious. So delicious and full of flavors that I didn’t even need to make the butter. I ate half of the whole batch. Couldn’t stop myself! I can’t wait until tomorrow lunch so I can eat it again. Thank you! I usually take a recipe and run with it, add this, that and the other thing, eliminate this or whatever. But this recipe is much better exactly as is! I tired coconut oil instead of butter and it’s okay but doesn’t have that delicious savory flavor. But if you make it exactly as is it’s great! This was sooo delicious! I made the pancakes for lunch with a salad and it was perfect. Definitely a keeper!